The Bichon Frise is a canine with a tiny physical appearance, but they certainly do not lack in personality at all. The feisty and almost always pleasant dog is a family pet with loads of affection to hand out. They are one of the most friendly types of dogs, even being friendly with other dogs, with strangers and with other pets in the home as well. Extremely kind and gentle, the Bichon is a great lapdog that will adore snuggling with their owners. Their happy demeanors make them a very adaptable breed to train, even as pups. They make exceptional playmates for any children residing in the same home and they can also be very playful. Due to their sweet nature, they always want someone or something to play with and are not at all considered to be loners. Usually, when they are left to themselves after a small amount of time sets in, they can have a tendency to bark often. The Bichon Frise is a petite animal, but has a hearty appetitive for activity. They enjoy playing in or outdoors and can continue to be active for most of the day with ease. Having them involved in any type of games is ideal for them to have the opportunity to exert some of that energy. Walking them on a leash will also suffice on a daily basis. The Bichon bodes a very bright, white fur coat that will require some grooming maintenance by brushing them a few times per week to ensure they get any trapped debris off their fur. Many owners enjoy keeping their fur around their faces neat and round by trimming it often. These dogs do not shed like the majority of the others, they will need that brushing to get the fur that does shed off and get tangled in to come off. 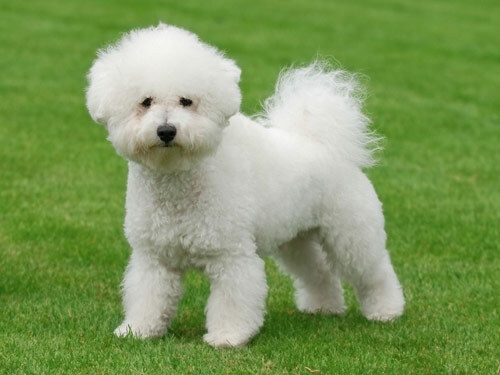 As far as health concerns are noted by experts, the Bichon Frise does not run into to too many issues as they age. They can develop conditions such as patellar luxation, which is more common amongst smaller canines and allergies as well. Some can also obtain Cushing’s disease. Some minor things to consider are CHD and eyesight problems such as cataracts. In rare occasions they have been seen for Legg-Perthes disease and for liver complications. Some screening tests the vet may recommend are for their hips, knees and eyesight as time goes on. The average lifespan of a Bichon Frise is from twelve to fifteen years long. They generally weigh between ten and sixteen pounds, with the males being slightly heavier than the female dogs. The Bichon Frise has been documented as deriving from somewhere in the Mediterranean, from a cross breeding in which a large water dog known as the Barbet canine was crossed with a smaller canine that bodes that signature all white fur coat. The Bichons were then categorized into four varieties. The Maltaise, Bolognese, Havanese and the Tenerife. They were previously utilized not only as companions, but as show dogs and performers as well. They received their nod from the AKC in 1971.